70% of people think that foot pain is normal. It’s not. Dr. Zeni and Dr. Russell are committed to providing the most advanced and effective orthotic therapy for their patients. Custom orthotics work on your feet much like glasses work on your eyes – they reduce stress and strain on your body by bringing your feet back into proper alignment. The plastic body of the custom orthotic helps to re-align the foot by redirecting and reducing certain motion that takes place during the gait cycle. Custom orthotics fit into your shoes as comfortably as an insole – and they have the advantage of having been made from precise imprints of your feet. 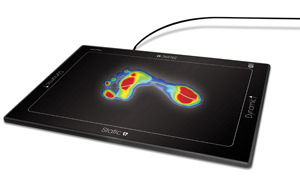 Our In-Line Orthotics GaitScan technology is an innovative diagnostic tool and digital casting device that allows Drs. Zeni and Russell to analyze patient biomechanics and order custom orthotic products. With 4096 sensors and a scan rate of 300 frames per second, GaitScan is the industry leader in dynamic scanning capabilities. A new, in-depth method of assessing your gait cycle with a dynamic scan gives the Doctors access to a wealth of information that cannot be obtained with the naked eye. Over a million points of data are recorded, tracking minor flaws in your biomechanics and shedding light on issues that if left untreated, could develop into painful conditions over time. Our In-Line Orthotics allow us to provide a valuable educational tool that provides a comprehensive biomechanical analysis for each patient as well as clear, concise images to assess and articulate the need for orthotic therapy. Please contact us for a free consultation to see if custom orthotic therapy is right for you.